As we all know that mother’s day is round the corner and we have only a few day to prepare nay gifts for our mothers. Here you will so easy and quick 32 DIY Motherday Gifts – Most Wonderful Ideas that you can literally prepare them in the last hours. The first idea that we have here is a mother’s day candle which is so unique that your mother would definitely feel special. 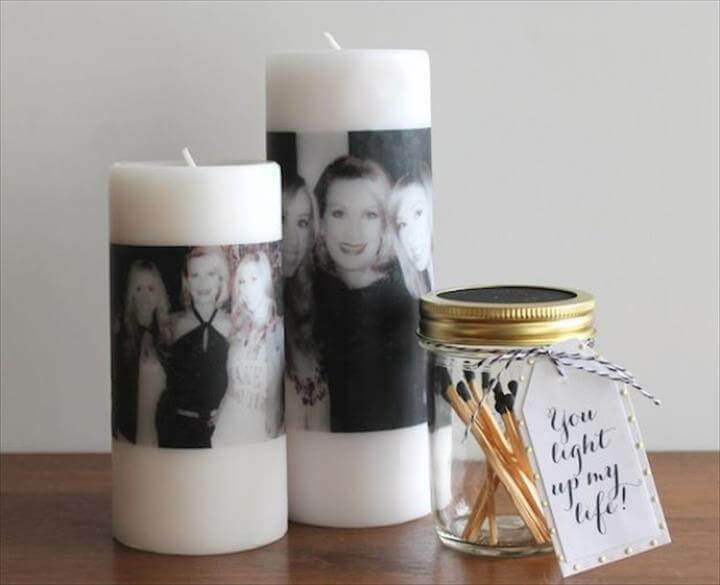 This is not a normal candle as it is a photo candle idea that can be easily done and presented to someone as special as a mother. Next we have a gemstone soap idea which has a very simple recipe and can be done with juts few simple supplies and ingredients. Following the recipe correctly will soon get you there. We would recommend you to start these projects right away so that you will get enough time to wrap your special gifts in special wrapping. If your mother is a clutch or a nag fan you can also make some fine leather clutch for her with scrap leather available at home. Add some spark to this mother’s day by making some special gifts for your mother like never before. You must have heard about the marbled look of mugs that is easily created on simple and plain mugs and can be given on special occasions to anyone. Try these mugs by dipping them into a mixture of water and few drops of nail color. Besides this you can also make use of the empty mason jars to create something new for this occasion such as putting a succulent plant into it and gifting it to your plant loving mother. These plant related ideas are nature friendly and will definitely be liked by your mother especially if she loves plants or gardening as a hobby. Share these ideas with your siblings and find out whats their opinion about all these gifts. Surprise your mother this mother’s day by making it way more special than before because handmade gifts are always more special than the readymade ones available in the market because the handmade gifts shows the hidden beautiful thoughts behind it.